Yield: Makes 16 mushrooms using the gingerbread templates. Enjoy these festive gingerbread mushrooms anytime of year when you get a hankering for wild mushrooms! Cream shortening and sugar. Blend in molasses and water. In a separate bowl blend all dry ingredients. Slowly mix the dry ingredients into the wet mixture until perfectly mixed. Cover; chill 2 hours. Heat oven to 375°F. Cut chilled dough into quarters. Roll dough onto pre-cut parchment paper (one quarter at a time – you will have to repeat this three more times) that fits onto a baking sheet. (So no flour is required during rolling, use another sheet of parchment paper and roll dough in between the two pieces.) Roll until about 1/8” thick. (This will not totally fill an average sized baking sheet.) Carefully lift the rolled dough on the parchment paper onto a baking sheet. Bake one baking sheet at a time for 9 or 10 minutes. Cool. Place pattern pieces onto cooled gingerbread and hold in place using thumbtacks. Using a sharp knife, carefully cut your pieces. 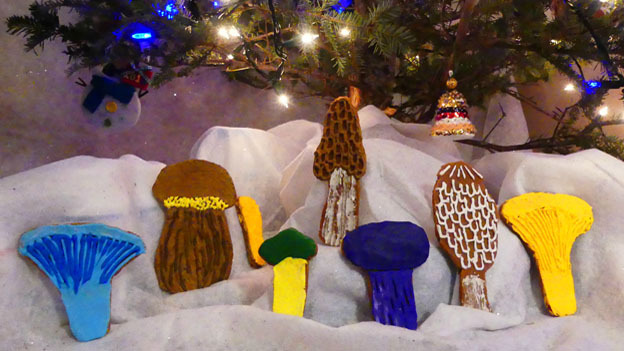 Use royal icing and food colours and decorate your gingerbread mushrooms!